Cortaderia selloana is a large ornamental grass that is native to South America, in particular the pampas grasslands, hence the common name. This clump forming grass has long slender arching leaves that have very sharp edges, so be careful when handling and do not plant near areas of high foot traffic. 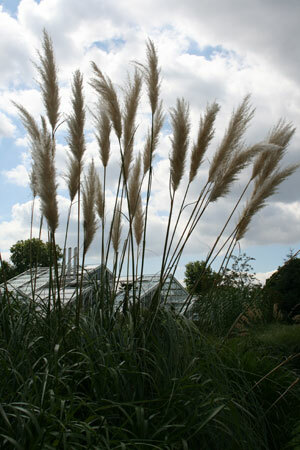 In late summer to early fall this grass will produce several silky silver-white plumes, which can reach 10-12″, be sure to get a female for the best show of flowers. Pampas Grass is a massive evergreen, reaching 12′ tall and 6 feet in width a maturity, works great for Xeriscaping and for screening. In some areas this grass can be invasive.